Advantages: heat-treated aluminum oxide grain; latex fiber reinforced paper; on a No-Fil base; no pigment in No-Fil; Higher shear rate; 30% increase in dust extraction; flexible and tear-resistant; improved load resistance; there is no risk of color transfer. 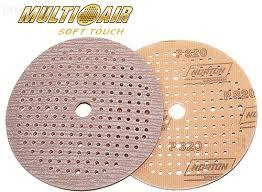 MULTI-AIR discs are made from the highest quality abrasive technology and are specially designed for extreme dry sanding applications. The No-Fil coating prevents dust from accumulating onto the disc to avoid premature clogging. At the finest grain size it can be used for final dry grinding before spraying.